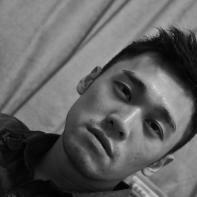 Nicholas YB Wong received his MFA at the City University of Hong Kong and is the author of Cities of Sameness. He is a finalist of New Letters Poetry Award and a semi-finalist of the Saturnalia Books Poetry Prize. He is on the editorial board of Drunken Boat and Mead: Magazine of Literature and Libations. Corgis are his favorite human breed. itself. Don't explore humanity, it isn't a planet. with humans after they put you down. Be one, at least, to keep your spine, running. willing to be walled by sorry cellulose. I'm at peace with botany and being re-searched as such. your teeth that would never be the roundest to bite. no one I know to take me partially, but they do. And say I'm their new whole. damned spot of this milk on my pants. yellow plastic of S / M / L. I tell him love information. love ungloves the body if humidity is 100%. or terms. like windmills. I think of the gender of thoroughly inform. as if it's built by Gaudi. I fill a bucket 4. Teach something new. being the brackets in his habits. If next morning we wake up with a breath bad 5. Make predictions. they induce when bent in bed, a dry lagoon.